The 1915 New York Yankees season was the 13th season for the Yankees and their 15th overall. The team was under new ownership and new management. The team finished with a record of 69–83, 32½ games behind the American League champion Boston Red Sox. New York was managed by Bill Donovan. Home games were played at the Polo Grounds. Opening day was an away game at Griffith Stadium against the Washington Senators. The Yankee opening day starting pitcher was Jack Warhop. The first game of the season on the home field was April 22, 1915, against the Washington Senators at the Polo Grounds with 7,000 attending. 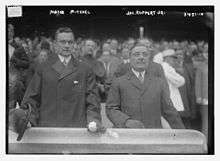 Mayor John Purroy Mitchel threw the ceremonial first pitch. 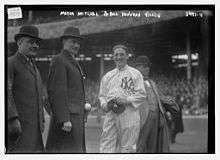 June 23, 1915: Philadelphia Athletics pitcher Bruno Haas set an American League record by walking 16 Yankees in one game.